Here is how the SEM works. First, the sample should be prepared to stand the high vacuum inside the chamber. Also, because the SEM works with electrons, the sample has to be coated with a thin film of gold or carbon, to conduct electricity. Once the sample has been prepared properly is placed on a stage inside the vacuum chamber. 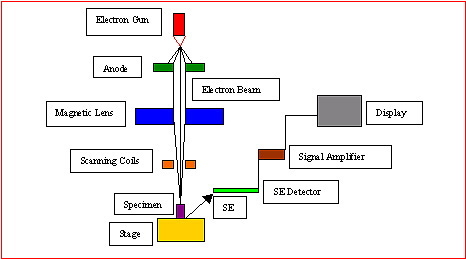 After the air is pumped out of the column, an electron gun emits a beam of high energy electrons. This beam travels downward through a series of magnetic lenses designed to focus the electrons to a very fine spot. At the bottom end of the column, a set of scanning coils moves the focused beam back and forth across the specimen, row by row. As the electron beam hits the sample, secondary electrons are knocked loose from its surface. A detector counts these electrons and sends the signals to an amplifier. The final image is built up from the number of secondary electrons emitted from each spot on the sample and is displayed on a screen. The newer SEMs are PC controlled and therefore the image is captured directly in a computer without the need to print the SEM image and then scan it in a computer. My artistic process starts in a laboratory where I can create different structures through the means of physics and chemistry. I called these structures, Nanosculptures. Basically I make sculptures at molecular level. For my artworks, I also use natural or other man-made structures of different materials at atomic and molecular scales. I called these structures, Nanolandscapes. The next steps are structure visualization and image capture. To accomplish these steps, I am using a Scanning Electron Microscope (SEM). 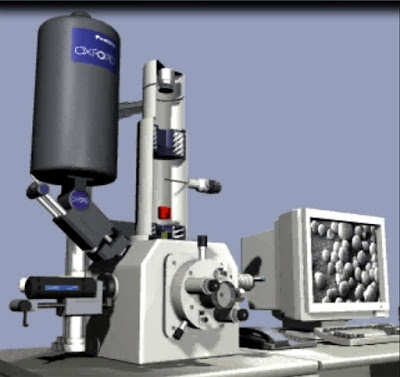 Scanning electron microscopy is a method for high-resolution imaging of surfaces. The SEM uses electrons for imaging, much as a Light Optical Microscope (LOM) uses visible light. Conventional light microscopes and photographic cameras, use a series of glass lenses to bend light waves and create a magnified image. The SEM creates the magnified images by using electrons instead of light waves. The images created without light waves are rendered black and white. The advantages of a SEM over a LOM include greater magnification (up to 300,000 X) and a much greater depth of field. Imaging is typically obtained using secondary electrons (SE) for the best resolution of fine surface topographical features. The image resolution for an ideal sample is in the nanometers range.